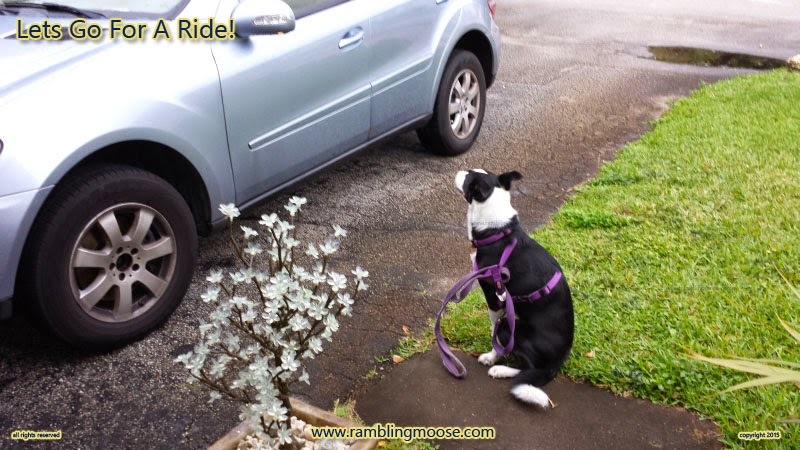 Rambling Moose: Lets Go For A Ride! What happened was we needed to go somewhere. There was a list of short errands to go through outside of the house. Our intent was to treat ourselves at a local burger joint, then head off to an office to inspect some construction work that needed to get done there. It was Saturday so the office would be empty. The problem is that someone put two and two together and got RIDE! Because we were going through the normal domestic machinery of getting ourselves together, we had forgotten to take the dog's leash off him. We had just come in from our evening dog walk and it slipped our minds. Maybe we were also telegraphing our intent to take him along. When you have a McNab Superdog like our boy Rack, you learn that you have to use very indirect and clumsy phrases to say things. Going outside to the backyard becomes "Traversing the rear portal to inspect the posterior of the owned land". Taking a ride in the car, well, that's more difficult. A suggestion is "Moving quickly on the highway in the large contraption.". We're human, we "slip" so that may be what is going on here. I also slipped with the door. It's a little tricky. If the weather is hot, it expands and gets very tough to close. In the frigid South Florida Winters it may not close when you expect it to. I mean, hey, after all, it has gotten to 34F, a mere degree Celsius over freezing! I was in the kitchen and I hear from the hallway two things. I walk to the door and start laughing. He figured us out. He nosed the door open just enough to squeeze a 45 pound dog through and trotted out to the end of the little walkway in front of the house. Then he parked himself there. The doors open out here to keep them from blowing open in a tropical storm so it wasn't all that tough. We just didn't know he knew how to do that. "Hey, come look at this!". I hear laughing in my ear followed by some ringing in it due to the volume. "Well how about you, Rack!" "Wanna Go For A RIDE! IN! THE! CAR?!?!?" Rack just looked over, gave me a smile, and looked back at the car with his tail wagging. He was also dusting the grass clippings from the pavement but that didn't matter, he was going for a ride! We gathered ourselves together. Rack Knew. We went up to Jack's Hamburgers, got a burger and fries and some root beer and ate in the parking lot. Rack also got two french fries and a double thumbnail sized piece of burger complete with bun sneaked to him but we won't tell anyone. A good day for a dog. Come to think of it, a good day for all of us.